This is a lazy spin on the popular Filipino pastry- Sans Rival. I said lazy because I did some shortcuts just to make it a little different while retaining the taste, the texture and the character which is crispy edges on the wafers and kind of chewy in the middle. Instead of using French butter cream for the filling and icing, I made Swiss meringue for stability and to cut down on the richness coming from the egg yolks. But make no mistake- the result is not in any way inferior; just simpler and different. Line 2 jelly roll baking sheet with parchment paper. 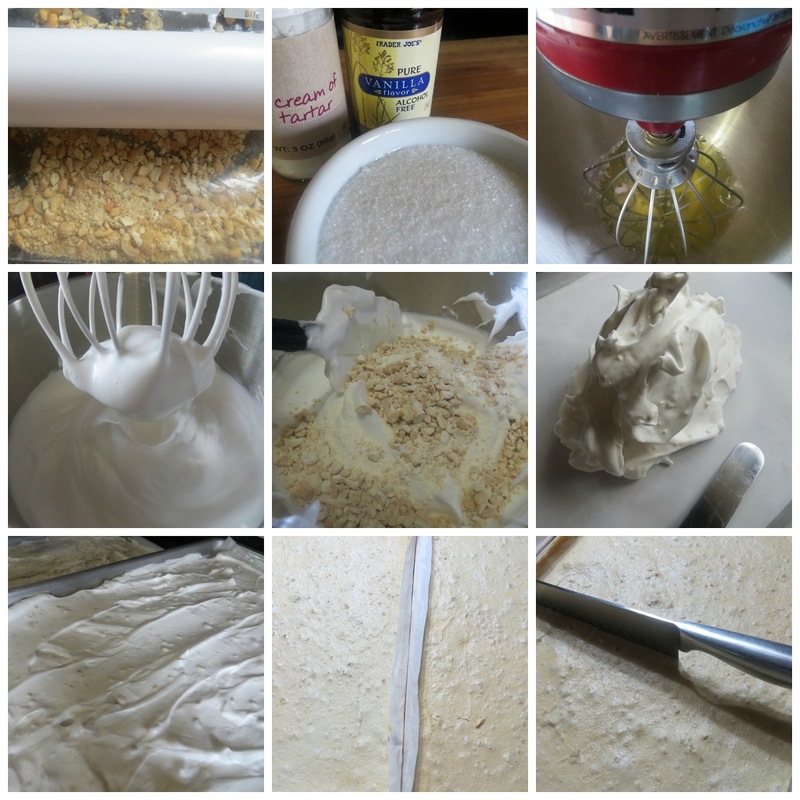 Using an electric mixer or a stand-up mixer, beat egg whites until foamy. Sprinkle cream of tartar and continue beating. Gradually add sugar, continuing to beat until stiff peaks form. Fold in half for the cashew nuts. 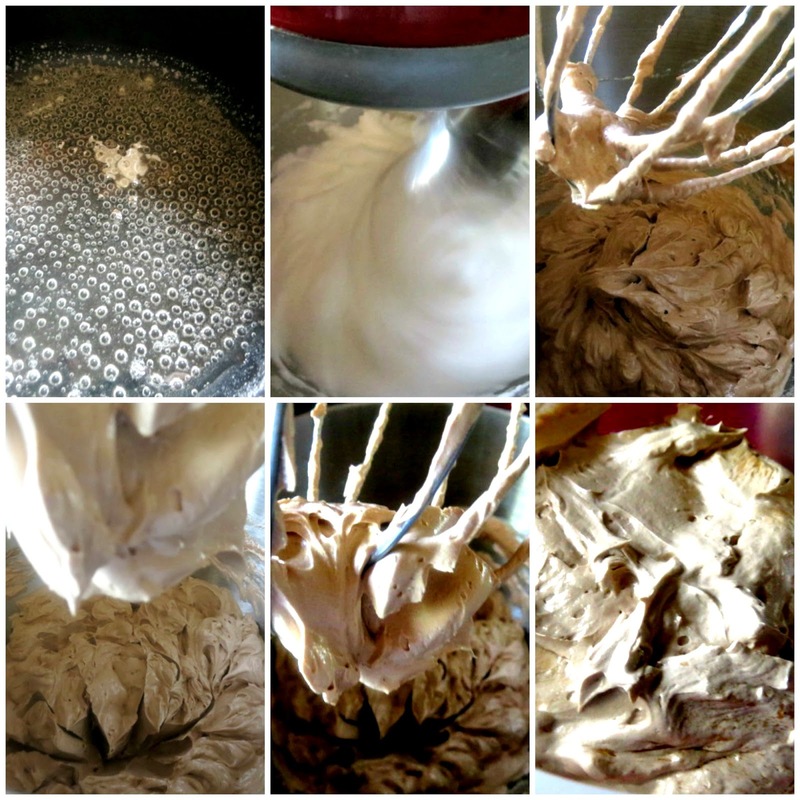 Divide meringue between the 2 pans spread evenly to edges. Bake in preheated oven for 30 minutes or until light golden brown. Remove the meringue from the baking pans and allow to cool. Split each meringue into two so you have four meringue sheets. You may trim the edges for a uniform shape. Set aside. Put sugar and water in a small sauce pan and bring to a boil. Swirl if you have to but do not stir. It should be done when it reaches the soft ball stage and temperature reaches 250 degrees F.
Meanwhile beat the egg whites until firm peaks form. With the mixer on medium, slowly pour the sugar mixture down the side of the mixer bowl (careful not to pour it on the whisk directly or you’ll splatter really hot syrup all over the place). Whisk until the egg whites have cooled off. Add the butter 1 cube at a time. If the butter is too cold it will clump, but don’t worry, just turn up the mixer a little and it will smooth out. If the butter is too warm, it will look runny, but again don’t worry, by the time you’re done adding butter it will firm up. Add the cooled melted chocolate and vanilla and whisk on high until smooth. Chill before using. Place one meringue sheet on a platter or tray. Spread prepared chocolate buttercream generously and evenly on top. Sprinkle 1/4 of the remaining cashew nuts on top. Place another meringue sheet on top and repeat the process. Spread more chocolate buttercream on the sides and the top and sprinkle with more cashew nuts. Refrigerate until firm before slicing.